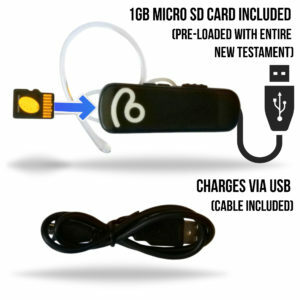 The Ohura Mini Bible Player has a headphone built in, so there’s not need for external cables besides of course the USB charging cable (included). Ohura is specifically designed for the purpose of working in an environment where our brothers and sisters desire the Gospel. ✪ EASY TO USE: Simple navigation with no confusing, small screens or tangled headphones. Comes with simple instructions. The “ear hook” is clipped onto the player to prevent slipping when the listener is engaged in manual labor (e.g. rice farming).